Big breeze can be one of the most fun conditions to sail in and with Quantum’s Dave Flynn four simple tips you can also be fast and efficient. 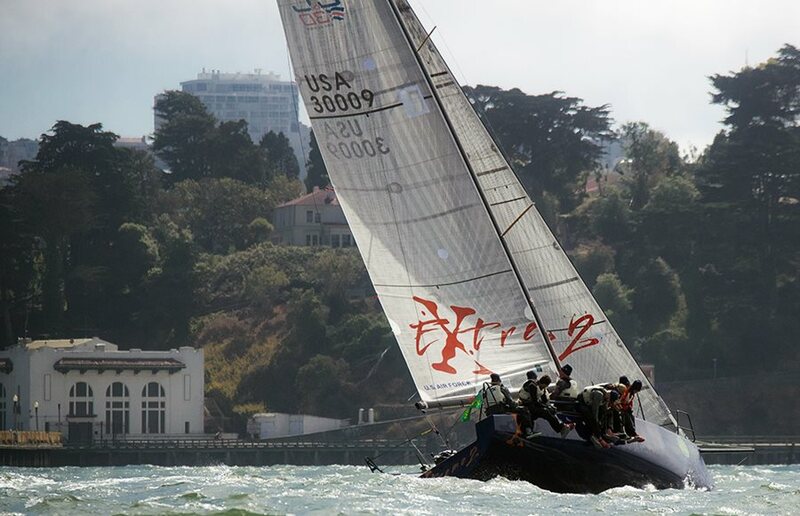 In the groove - The Extreme2 C&C 30 team show their upwind expertise during a regatta. Photo courtesy of Dan Cheresh and the Extreme2 team. Strong wind can be a tricky condition to sail in. However, with some small tweaks and considerations, you can make big gains on the racecourse or more comfortably get to your destination. Here is what you need to know to get up to speed, balance the luff, manage heel, and crush the waves. There is a saying that defines what makes for good upwind sailing: speed first, then pointing. This is particularly important when the breeze is up. If you trim as you would in medium wind conditions, the boat will just roll over and play dead. You also have to deal with the waves that usually accompany big breeze; they take extra speed to get through. So how do you go fast? Start by putting your small headsail up, making sure both sails are as flat as you can make them (backstay, outhaul, luff tension, etc., all on hard). The real key is not to trim as hard as you would in normal wind conditions. Start with the sails well eased so it is easy to get the boat going and then gradually wind them in. When the boat gets hard to steer and hard to keep moving, you’ve gone too far. Both sails need to be de-powered evenly. A common mistake is to have the jib sheeted in hard with the mainsail trying to do all the work. The headsail trimmer needs to consider how the jib is affecting the mainsail. If the mainsail is luffing completely in the puffs to keep the boat on its feet, you need to change the jib setup. Move the lead aft (or up and out if you have athwartship jib tracks) to flatten the foot and twist off the top of the sail. The top of the sail will luff before the bottom. Don’t worry, it should. If the luff is still not balanced, ease the sheet an inch or two. You should be able have the back half of the mainsail working or at least the bottom battens in the biggest puffs. In the big blasts, you will need to ease the jib as well as the mainsail. The trimmers should watch the heel and the telltales just as if they were driving. If the driver has to feather too much (i.e., come up and let the jib start to luff), then the sails need to be eased. Just a quick burp on the jib sheet will make a huge difference. It is ideal if you can trim the jib from the weather side. For the driver and trimmers, a constant angle of heel is the goal. Don’t worry so much about the telltales. In the puffs the driver lets the boat come up instead of fighting the helm and the trimmers ease as necessary. Too much heel and you will have too much weather helm. Too flat and you will not generate enough speed. Monohulls are very sensitive to small changes in heel angle. If you are looking for speed, bear off just a bit to create a small amount of extra heel. Don’t go too far chasing the speed. Be patient. If it doesn’t come, ease the sails. Classic teaching techniques suggest that steering through waves should be a matter of coming up the front and then bearing off down the back side. This technique works well in big ocean swells with lots of space between waves (or in really small boats). However, for most of us sailing in waves with a short, steep chop and little spacing between waves relative to our boat’s length, speed and just a little heel are our friend. But just a tiny bit now, no rolling over! As a big wave set approaches, bear off slightly, easing sails as you do to keep heel under control, and hit the waves with pace. If you were averaging 6.3 knots, you might now want to be going 6.8 knots. You also don’t want to hit a wave with the boat too flat, which is the danger of trying to steer the wave up front. This will make the boat pound and slow down. The reality is that you are going to hit waves, and there is usually little chance of steering completely around them. Hit them with extra speed and a touch of heel, then sheet back in and sail more upright in the flat spots. This article originally appeared in SpinSheet magazine. Great article. I know that writing this article to cover a wide range of boat is difficult. The paragraph on how to hit waves was particularily useful to me as I don't typically deal with big waves, rather chop. Also, if you have a way to reply I could use the same article but tailored for a J/29 Masthead rig. Hi Dave, Dave's basic principals above are a solid base. You can apply these to the J29 as a base/starting point and tweak, (while following the basic principals) to suit your boat. However, there are areas you can go to to talk to J29 guys. For instance there's a 29 named Puffin that is sailed by Quantum guys out of the north east. They typically compete at Charleston Race Week and Block Island. If you go to CRW archives and look for their boat you'll find the skipper name and can track him down through Quantum. I'm sure he'd have a lot of good info for you. Also, if you dare, you can go to Sailing Anarchy. They have a J Boat message board and you can post/search there for info as well. Hope this helps.